Several COMPACT partners attended the ITEA event - as part of the EUREKA Innovation Days - in Helsinki to present the COMPACT project. The ITEA event took place from May 22 to 24, 2018. Thanks to our sponsor SparxSystems. 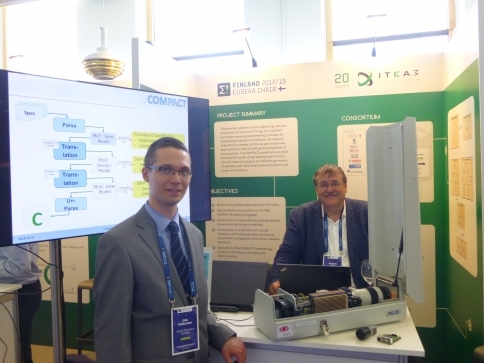 The picture shows project coordinator Prof. Dr. Wolfgang Ecker, Infineon Technologies AG, DE and Esko Pekkarinen, Tampere University of Technology, FI at the COMPACT booth.